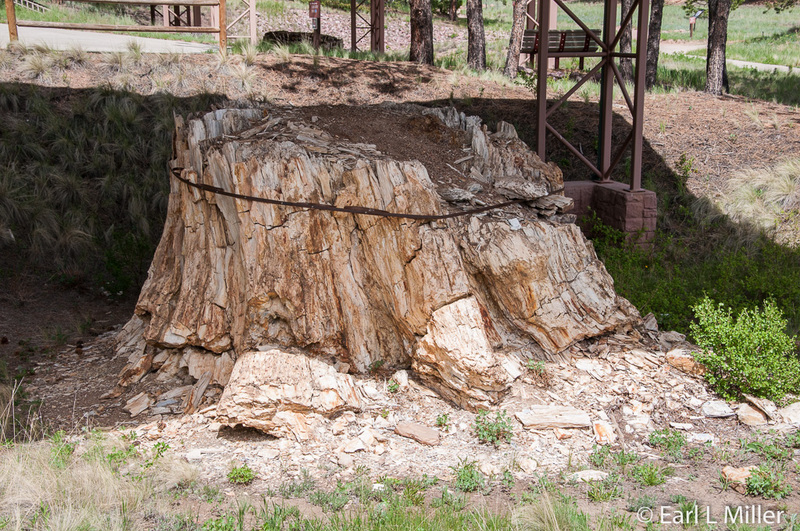 Our Sunday, we visited Florissant Fossil Beds National Monument in Florissant, Colorado. Lying 34 miles west of Colorado Springs, it’s a trip back to the Eocene geologic period, 34 million years ago. That was the period between dinosaurs and human beings. We learned the area, now home to pine forests and meadows, once housed 250-foot Redwood trees and an ancient lake attracting many animal species, including numerous types of insects. The weather was temperate. Vegetation resembled today’s plant communities in southern Texas, northeast Mexico, and eastern Asia. The monument is noted by paleontologists as one of the richest fossil beds in the world yielding 50,000 museum specimens, of more than 1700 species. This includes 150 plants and 1,500 insects including the world’s only known fossilized tsetse fly, a species now found only in equatorial Africa. All classes of animals, with the exceptions of amphibians and reptiles, have been discovered, with beetles the most common insect. Florissant fossils are in more than 20 U.S. and United Kingdom museums. Harvard University houses 8,000 fossil insects that paleontologist Samuel Scudder found in the late 1800s. T.D.A. Cockerell of the University of Colorado and Harry McGinitie, of the University of California, Berkeley also studied specimens here. To better understand what you are seeing, first watch the 10-minute movie “Shadows of the Past.” It provides insight into the area’s geology, covers the activities you can do here, and explains how the area became a national monument under Nixon in 1959. Then tour the excellent visitor center. One case provides examples of how fossilized teeth led to the identification of mammals such as shrews and rabbits. You’ll also spot dioramas of the Eocene representing the land and lake bottom. 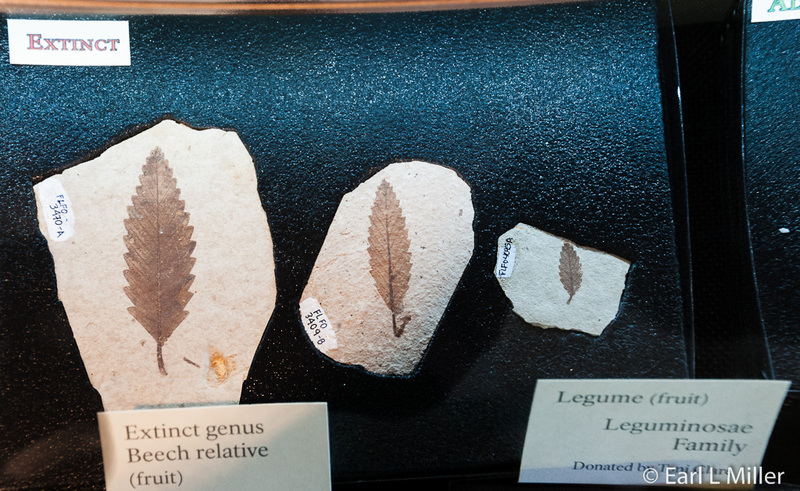 These portray what would have been area fauna and flora, with pictures of fossils of the various species described. Other exhibits explain the area’s geology, the scientific work of paleontologists, how these fossils formed, and more. I found the most impressive interior exhibits are the two cases near the theater. Both are filled with fossils. One case houses vegetation while the other devotes itself to insects, a Bowfin (fish), and a Pirate Perch. Some of the fossils found here have relatives in modern life. Others are extinct. Still, others are found in a different location on Earth. How did all this fossilization occur? The massive Guffey Volcanic Complex lay 15 miles to the southwest of the current monument. When this volcano erupted, its lava combined with ash, water, and, perhaps, snow, to create mud flows called lahars. These covered the area. The volcanic sediments broke down to soil on which forests grew. Streams, flowing in the forest, attracted the mammals who lived there. These animals became buried in stream deposits and were fossilized. More mudflows covered these deposits. A later Guffey lahar later dammed a stream creating Lake Florissant which stretched for 12 miles. During the volcanic action, silica flowing from the volcanic ash led to algae blooms. Films of this matted algae (diatoms) trapped insects and leaves, then sank. Layer after layer of Paper-thin shale formed on the lake’s bottom preserving tiny features of leaves and insects in great detail. Besides the visitors center, the monument’s 14-miles of hiking trails provides ample opportunity to explore the area’s wildflowers and wildlife. It’s possible to observe anything from a golden eagle to a mountain lion or elk. 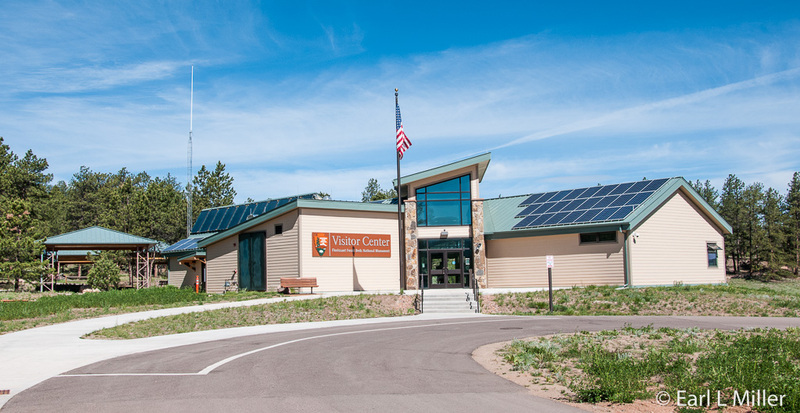 The wheelchair-accessible, half-mile Ponderosa Trail starts behind the visitor center, and concentrates on nature. At the trail’s beginning, look for the huge petrified Redwood stumps including a pine tree growing out of one of these stumps. 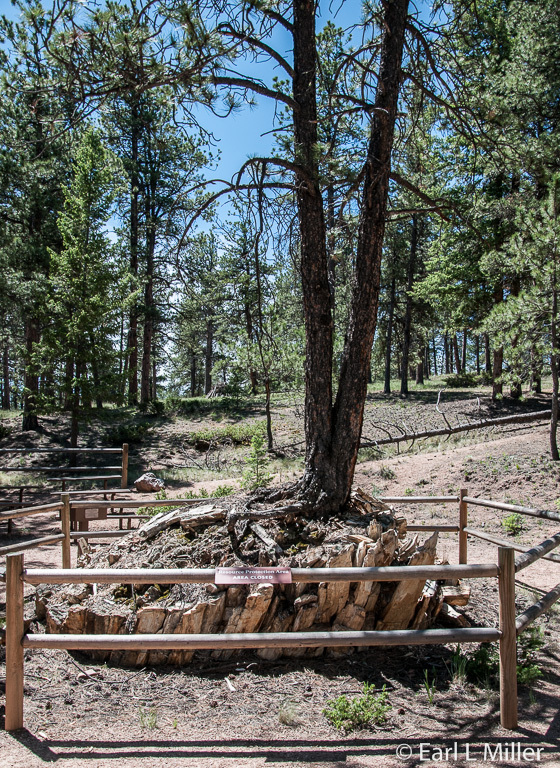 On the one-mile Petrified Forest Loop, you’ll view a fossil excavation site, the Big Stump (38 feet in circumference), and other massive stumps. Ranger activities depend on the number of rangers they have working that day. I was disappointed that the 10:00 a.m. talk at the amphitheater was cancelled. They did hold a ranger walk at 11:00 a.m. Sometimes they hold a talk at 3:00 p.m. at the Hornbek Homestead. If you want to visit, admission is $3 a person. If you or a family member have a federal pass, it’s free. Summer hours are 8:00 a.m. to 6:00 p.m.
Adeline Hornbek and her four children settled in1878 just south of Florissant due to the Homestead Act. Their four-bedroom home was the only two-story house in the valley. It had Victorian furnishings, wood floors, and glass-paned windows. Hornbek supported her family by working at the area’s general store. She owned livestock valued at $4,000 and held many socials at her home. When a ranger isn’t lecturing at this site, you can go by yourself and look in the windows as the home isn’t open. Take time to explore the outbuildings moved from former homesteads in the park: the 1890's barn used originally as a house; a carriage shed dated 1928; well house from 1909; and an 1880's bunkhouse. 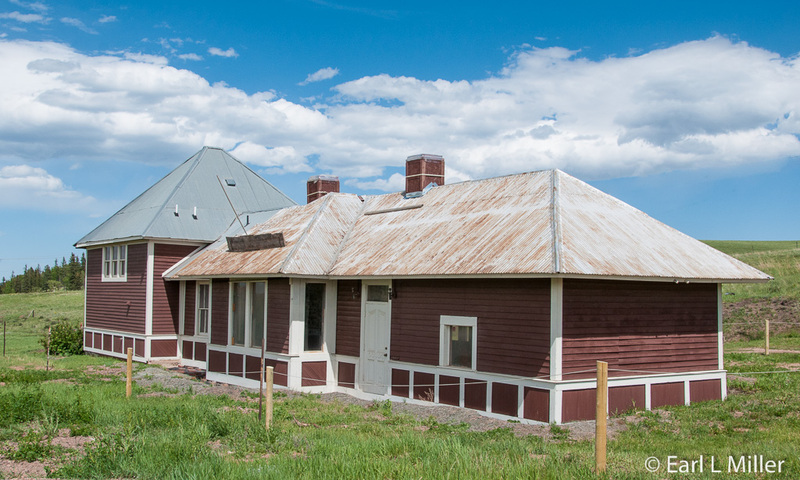 Before we left Florissant, we heard a lecture by David Martinek, a member of Teller County Historic, the group actively restoring the Divide, Colorado Depot. It was presented by the Pikes Peak Historical Society at the Florissant Library. This depot, built in 1904, served two railroads. The Colorado Midland Railroad ran east and west through the mountains from Colorado Springs to Grand Junction. It started in 1887 and ceased operations in 1918. The Midland Terminal serviced the Cripple Creek Mining District from 1895 to 1949. The railroads shared track from Colorado Springs to Divide. It was just east of this depot that the track split. Four trains a day passed through Divide carrying passengers and ore.
A first depot existed from 1887 until it burned on November 1, 1898. The current structure had a waiting room on the east end; a dual agents’ area, because of the two railroads, in the middle; and a freight room on the west. The building was used for different purposes. It was sold to the Weaver family around 1950 to be used as their residence. They abandoned it during the later 50's and opened an antique store in the 1960's. A new owner bought the property and built an annex as a residence in 1985. He opened in the 1990's, at the depot, a roadhouse and biker bar called Whistle Stop. Renovation started in 2008 with the building’s crumbling foundations being a major trouble source. The project is supposed to be completed by 2019. At the conclusion, the depot’s original floor plan will be recreated with the annex converted to a gift shop. The group also hopes to redo the brick platform, reconstruct two railroad grades, and install track. We ate breakfast at The Pantry, in Green Mountain Falls, on the way to Florissant. This small town is located close to Woodland Park. The structure was built as a home in 1905 and has served continuously as a restaurant since 1938. It features locally grown vegetables and homemade desserts and breads. Even their Ranch dressing and mashed potatoes are from scratch. You can dine inside or on their patio. 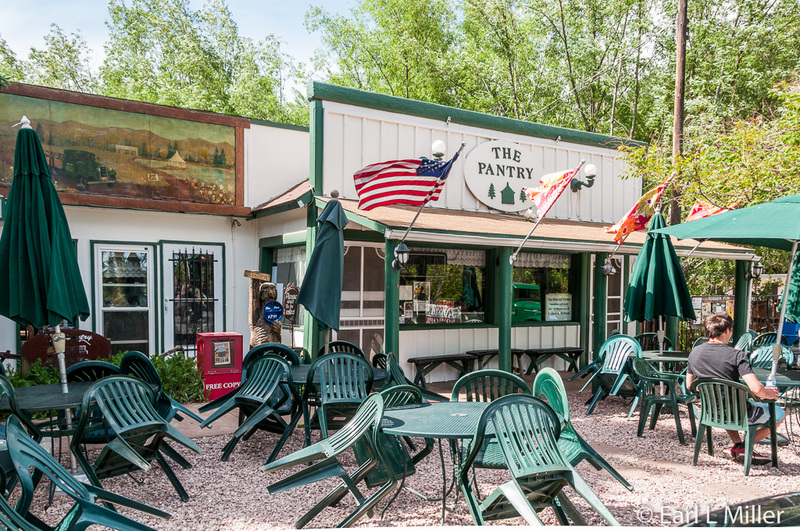 The Pantry is open daily from 7:00 a.m. to 2:30 p.m. On Saturdays and Sundays, they serve a breakfast buffet from 9:00 a.m. to noon behind the restaurant. During the summer, Thursday through Sunday, from 5:00-10:00 p.m., they have an all-you-can-eat Mountain Miners Cookout. Wine and mixed drinks are available. It features BBQ chicken and ribs, brisket, Smothered beef steak, and Rainbow Trout Almondine. One unusual aspect of spiders found in the formation is they weren’t discovered with their legs curled up, as with modern spiders when they die. Instead, the fossilized ones had fully extended legs.